Stainless steel is a high strength and aesthetically pleasing material making it perfect for decorative applications. It offers the strength of steel with the benefit of corrosion resistance. Available in two grades, 304 and 316. 304 is the general grade, easy to machine and form, very good for welding offering good corrosion resistance. 316 offers better corrosion resistance and is recommended for marine or coastal applications. For prices and sizes available give us a call or fill in the request a quote form. Stainless steel offers the strength and workability of carbon steels whilst also offering corrosion resistance. The high strength of stainless steel combined with its workability and corrosion resistance makes it a perfect choice for angle sections. Bracket connections can also be strengthened by using stainless steel angle sections and the corrosion resistance makes it a perfect application for outdoor construction. The aesthetic look and appeal of stainless steel also makes it a viable and potential alternative to carbon steels. 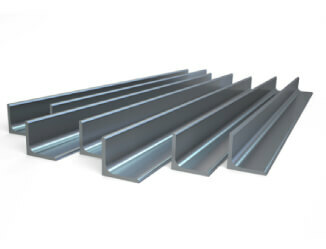 South West Steel offers a wide array of Stainless Steel products including sections, sheets and bars. If you are looking for these products and wish to see dimensions and prices then do not hesitate to contact us today for a free quotation.